Black Bear Singers is a drum group from the community of Manawan, of the Atikamekw nation in the province of Quebec (Canada). We began singing together in the year 2000, and our style is northern contemporary. We are very proud of our Atikamekw culture and our heritage, as well as our language that is still commonly spoken today. One aspect of our rediscovered cultural identity is vocal expression accompanied by drumming. We sing strong and we gather strength from our song. Kokum, our spiritual grandmother, has always told us to sing, to try hard, and to never give up. We take this very much to heart, and carry her always in our memory. We have entitled our album “Out of Hibernation” because we conceived it in the spring, when the black bear wakes from its winter sleep. We refer also to the beginning of our powwow season. Spring is a time for us as well to leave home and begin our travels. Where we are from. This is where the Atikamekw people had lived. Their children were born, the first words were said Notcimik. Ancestors always relied on it to live. Our culture, our language and our medicine swear by it. 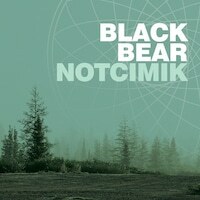 Hunting, healing and everything else we need to survive is notcimik. We hope and pray it remains this way, that we always defend and keep our lands so we forever can have what we call home. The Black Bear and the Atikamekw people of Manawan are inseperable from the subtle changes of the seasons. Our last album “Out of Hibernation” was dedicated to the time of year when we all come out to be reborn. We dedicate this album to the next stage of our annual process, Spring Medicine, when the Black Bear replenishes himself as he roams the land in search of medicine which will heal him after the long hibernation. Originally from Manawan, Black Bear: Makate Masko have been on the powwow trail for 13 years. We have evolved tremendously within our group. Slowly Black Bear’s family grows with the arrival of new descendants. Some of us go to school and others to work. Today our goal is to show our children and the world what we like to do, so that it continues in the generations to come. It is our duty to demonstrate perseverance (or to be an example of perseverance). We would like to share with you our songs and our Atikamekw words. Please accept our most heartfelt greetings. We have been interested in pow wow music since 2000 and we have never seen such a thing as a pow wow drum group working with musicians from different styles of music until now. Meeting members from A Tribe Called Red was very eye-opening for all of us. We discovered a new style of making music and we are really happy to be part of their music. This album was recorded in St-Zénon where we did two things at the same time. As a drum group, we decided to record our songs live in the studio. As for A Tribe Called Red, we recorded voices and drum separately and many other things so they can create music from there. We have been interested in pow wow music since 2000 and we have never seen such a thing as a pow wow drum group working with musicians from different styles of music until now. We are a Northern Contemporary Drum group and most of the songs in this CD are word songs sung. The Black Bear and the Atikamekw people of Manawan are inseperable from the subtle changes of the seasons. We grew up on a reserve called Manawan in mid Quebec. Where we are from. This is where the Atikamekw people had lived. Their children were born, the first words were said Notcimik. Ancestors always relied on it to live.